Corsa Performance 14178 - Corsa 300C / Magnum / Charger 6.1L SRT-8 Dual Exit w / Single 4.0 Pro-Series Tips - Sport; 2005-2010. 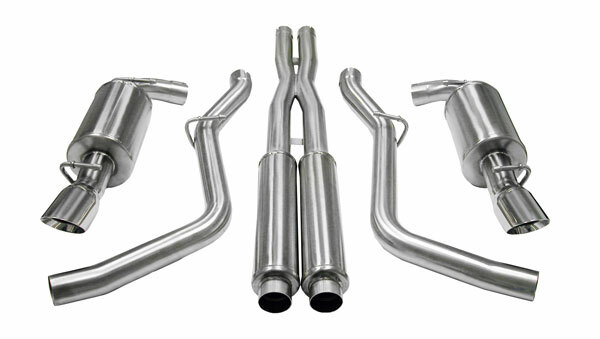 CORSA Performance Exhaust Systems for the SRT-8.300C/Magnum/Charger 6.1L HEMI 2005-10 RSC-Dual Rear Exit w/Single 4.0 Pro-Series Tips. Straight-through, 2.75 nonrestrictive design specifically tuned for the vehicle. Flow bench-tested 39% gain in exhaust flow vs. stock muffler. Patented CORSA Reflective Sound Cancellation Technology. Dual rear exit with single handcrafted Pro-Series 4.0 tips for enhanced vehicle appearance. No welding required; Bolt-on installation. Limited LIFETIME WARRANTY for as long as you own your vehicle. There is no drone with the CORSA exhaust system because the CORSA exhaust system uses RSC technology to eliminate problem frequencies that cause interior drone/resonance at cruising speeds. CORSA&apos;s Chrysler 300 300C exhaust system features a patented non-restrictive Straight-through design reduces back pressure and frees up additional power resulting in improved horsepower and torque. As an additional bonus, your Chrysler 300 300C can result in greater fuel economy because of less back pressure and more power. Below are other popular parts other customers have purchased for their Chrysler 300 300C.